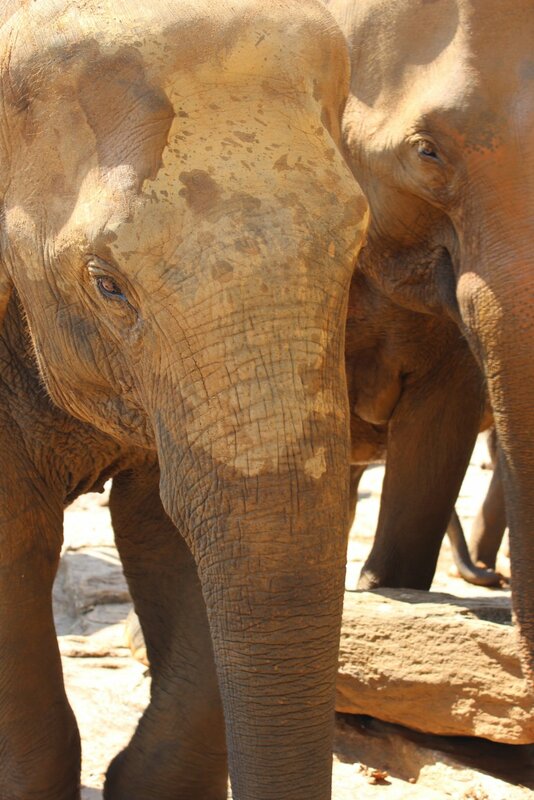 Along the Colombo road there’s a turn off that leads to the Pinnewala Elephant Orphanage, a government-run sanctuary where orphaned or abandoned elephants are looked after. Twice daily all 80 elephants are led down to a river to bathe. 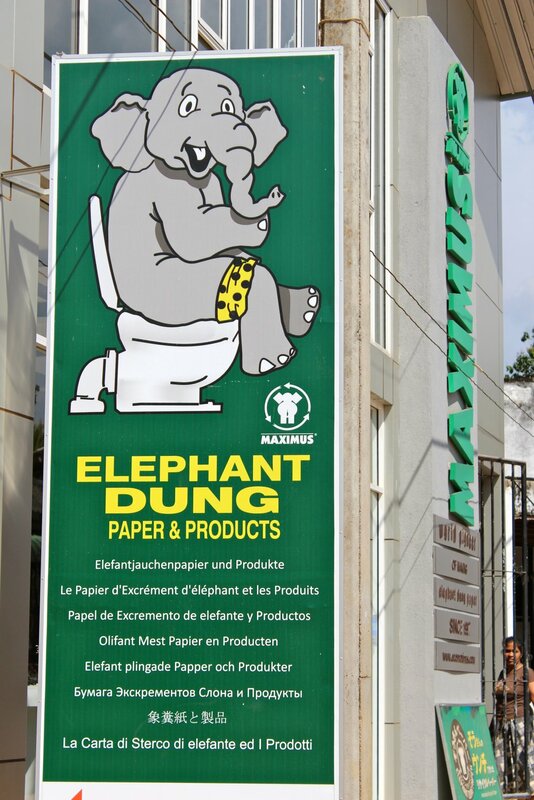 It seems like it must be the largest number of pachyderms anyone’s ever likely to see up close. Inside the sanctuary area we saw elephants everywhere, some roaming across the rocky ground while others clustered together. In the distance were the Sri Lankan mountains, a rich green backdrop. It was only a matter of time before we were approached by one of the mahouts (the elephant trainers) for the obligatory ‘tourist with elephants’ photograph. After the elephant had taken a swipe at my husband with its ear, the mahout handed him a huge pole to hold. (This effectively ended the swipes.) Seconds later, the photo had been taken, and we were preserved for posterity; my husband on one side, elephant in the middle and me on the other, my hand gingerly placed on the trunk. Then the touting for money began. We’d already paid to get in but this was different. 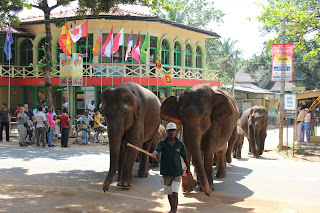 We paid the Sri Lankan who took our photo – with our camera of course – and the man who told us where to stand, the man who handed my husband the pole, and the man who’d placed my hand on the elephant’s trunk. With so many outstretched hands and cries of, “But I’m a very poor man,” we dispensed as many rupees as we could before escaping across the road to the river. As we were about to cross, a huge procession of elephants approached. This was too good a photographic moment to miss, so I stood in front and snapped before being grabbed by my husband and dragged out of the way. “Do you want to be trampled?” he muttered. 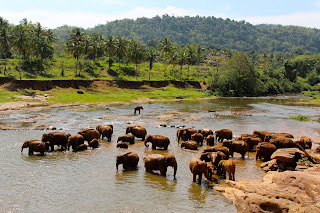 Down by the river elephants wallowed and threw water over themselves. Given the very hot day, I could see the cooling appeal. Obviously one of the mahouts felt the same way. He moved slightly upstream, stripped down and completely submerged himself. Like the elephants and the mahout, the heat eventually got to us. 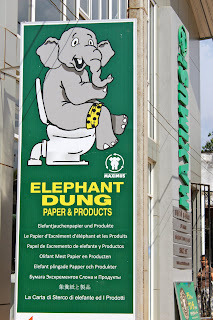 We walked back to the van, only pausing to smile at the advertising slogans for elephant dung-inspired paper products. Once in the van again, we turned up the air con and carried on to Colombo.